Japanese adaptations of Lovecraft’s works have largely been limited to the printed page and video games, perhaps mercifully so considering the cinematic catastrophes called down by well-meaning film makers the world over. Yet every so often, one oozes to the surface like ichor from the wounds of some unfortunate god buried alive under the rubble of contemporary culture. Innsmouth wo Oou Kage, aka The Shadow Over Innsmouth, is once such anomaly. Writer and director Konaka Chiaki (Marebito, Serial Experiments Lain, The Big O, multiple made-for-TV adaptations of horror manga ) and leading man Sano Shiro (Evil Dead Trap 2, Kansen, Teito Monogatari, various Edogawa Rampo adaptations) are bound-by-blood mythos afficionados. Though normally you would be correct in passing over anything made by network TV, especially a horror film, things are a little different when you've got the Japanese equivalent of Stuart Gordon and Jeffrey Combs on the case. Rumors of the made for TV movie have circulated amongst the most devoted of followers, presumably making the rounds on a singular unmarked VHS cassette. At last, the footage has clawed its way up from unfathomable depths, to stand on the shores of the Internet before being dragged back down by overbearing network watchdogs. Youtube presents the film in 7 parts. There are no subtitles, so I have provided a running commentary under each video for those of you sane enough to forgo the ancient tongue. For those of you proficient in the maddening runes, you may proceed to Niko Niko Douga to enjoy some wwww with your Iä, Iä! A number of queer coincidences conspire to bring our protagonist, a freelance photographer played by Sano Shiro, to the worm-eaten village of Innsmouth. After encountering a grotesquely featured man on the streets of Tokyo, rifling through the company archives reveals a photograph taken in Innsmouth of a person with identical deformities. His cursory research into Innsmouth is inconclusive, only managing to scrounge up an article from a weekly gossip mag detailing an incident involving the decayed corpse of a fish man washing up into the bay. He convinces his boss (who bears a striking resemblance to Lovecraft) to send him to the forgotten hamlet. Through their interplay we learn that the protagonist has a sordid past. His father is deceased and mother is hospitalized in Room 209, suffering from an unspecified illness. At (6:05) he arrives at the most ominous of crossroads, teetering on the edge between Arkham, Dunwich, Kingsport, and Innsmouth. The bus driver is unusually suspicious and standoffish, leaving our protagonist in the dust when he steps off to break a bill for his fare. While contemplating his next move he is accosted by a rough codger who warns him to stay far away from Innsmouth. He spins tales of the fishing village, once frightfully prosperous with its catch, now impoverished and dying, with only old people left to hold up the rotting infrastructure. Luckily for our hero, he manages to hitch a ride with a local Arkham girl who runs deliveries between Innsmouth and the neighboring areas. He waves off her playful advances as The Doors paint it black around them. Having arrived at Innsmouth, the delivery girl offers him her card and, in more ways than one, a cheap ride back to the city. At (2:05) our protagonist rolls his first sanity check at the local greasy spoon, the Fujimiya Eatery. Next he checks into the Fujimiya Inn, talking the reluctant owner into letting him stay the night. Near the end of Part 2, he encounters the beautiful woman he glimpsed on the bus who bears an odd semblance to the one from his dreams. The protagonist wanders into the Innsmouth Folk Museum. Upon meeting the curator, the he immediately deduces from the lack of accent that he is not a local. This is partially true, the curator assents. Born in Innsmouth, he left for Tokyo, only to return 3 years prior to his hometown nestled in the mountains. The two discuss the pictures on the wall taken by the famous photographer, Fujimiya Iemon. Our narrator comments that, while he used to find these works repugnant, as of late he has grown to appreciate, and perhaps even view them fondly. Afterward the protagonist catches up with the mysteriously youthful widow. As they pause for a drink, she remarks that the water in town tastes vile. The contents of the glass she holds were taken from the mountain, where the streams are clean and sweet. Once again the protagonist notices the lack of accent. It is revealed that she is not of Innsmouth stock, but rather was brought here an unspecified time ago. Later that night, the protagonist manages to snap some shots of a strange ritual on the beach. Against his better judgment, he has begin to fit together pieces of the puzzle. He notices that everyone in town shares the family name Fujimiya. Returning to the Folk Museum, he inquires into the cultish activity witnessed on the beach. The curator is free with his information. The townsfolk idolize a being named Dagon though an amalgam of foreign, that is to say, Buddhist rituals, and indigenous sea-god worship. And the relic behind them? The Boat of Resurrection. When people die they are sent out to sea in this vessel where they are said to attain eternal life. Reeling from the unfathomable horrors the curator’s hinted dialogue alludes to, the protagonist shirks, overcome by the damning feeling that he has seen all this before. As if to comfort him, the curator offers a piece of cryptic advice. “Man needs to create stories. Where you were born, where you were raised, what you are doing at this very moment―These thoughts are nothing more than chapters in a story we create for ourselves, a story called ‘memory…’ These memories are mere illusions. Yet man needs these illusions to live... or so was written in a book I read, long ago." At (5:00) we reunite with the delivery girl and learn of her history. Born in Arkham, she doesn’t want to be like all the others who left the region for Tokyo , a cowardly move she feels amounts to abandoning one's roots. The protagonist echo’s the curator's previous statement. “Life is an illusion, so what does it matter?” Impressed by his unconventional insight, she invites him to spend a night in Arkham, but he blows off her advances with aloof flourish. We return to the widow’s waiting arms. “I always knew you would come back,” she coos enigmatically. Just as things are heating up, Peeping Toms with hideous unblinking eyes show up to spoil the mood. Delirious with fright, he staggers into the moonlit streets where he is grasped by a singularly grotesque man. The beast half-speaks, half-croaks a single word: The name of the protagonist! In a fit of mad disgust and sexual frustration, he kills the man in cold blood and tramples the corpse. Unbeknownst to him, the delivery girl observed the brutal proceedings in their entirety. Somehow he manages to stumble back to the inn, visions of his childhood memories becoming increasingly vivid and urgent. He has no time to contemplate their sinister implications, as a mob of ghastly vigilantes descend upon his room! Ducking into a dim alleyway away from his pursuers, he phones the delivery girl, who returns his cruelty in kind. His hopes are dashed against the falling receiver. The mob finally catches up with him, but they are no longer interested in vengeance. It’s almost as if he’s been accepted into their brood. He returns to the Folk Museum to make a series of maddening discoveries. First, pictures he has taken lined up next to those by Fujimiya Iemon. Next, the blood-dripped corpse of the man he killed, placed in the Resurrection Boat. As the insane reality presented by the facts at hand comes bearing down on him, the curator appears to give our chilling tale its last rights. “If you think I am lying, then answer me this. Who is this women in the picture with you?" In a last ditch effort to save his sanity and soul, the narrator calls the hospital. Alas, his mother is not registered. There is no room 209. He has no choice but to gaze upon the true face of his father, and his future. Meanwhile, the delivery girl, in a change of heart, arrives in Innsmouth to save him, only to be abducted by its monstrous inhabitants and forced to wear a ring, the same one seen on the beautiful widow’s hand. The curator sighs as he shuts a paperback edition of the Necronomicon, cursing his return to this shunned place. On the beach, a trail of blood suggests that the father went out to sea to attain life eternal. Our protagonist returns to the office, seeming no worse for wear, and delivers his film and report, titled The Shadow Over Innsmouth. Note the hilarious pen name, a literal translation of Lovecraft. In the final reveal, he drives off into the sunset with the delivery girl, back to their ancestral birth place, to spawn a fresh batch of progeny. We can better understand the story by examining its differences from the source material. Namely, the thematic shift from external forces to internal forces. Lovecraft's story is driven by fear of outsiders who would "spoil" the pure, indigenous bloodline. Konaka's version instead focuses on a topic close to the heart of the nation's young people: The internal struggle and guilt of abandoning yours roots. Rural depopulation is a serious problem in Japan. Farming villages have been irreversibly ravaged by a massive youth exodus to the cities, the Tokyo brain drain, which left behind only the older generation to tend the ancestral land. Those who remained are the ever-shrinking base of a peninsula eroded by the tides of change. When the old guard pass away, the village shall go under with them. There are three classifications describing the pattern of youth movement towards the cities and away from the countryside: I-Turn, J-Turn, and U-Turn. They include those who leave and never return, those who leave but return to a nearby rural city, and those who leave and later return to their birthplace, in that order. Each of the main characters represents one of these archetypes and struggles with the weight of their choice. They are aware that in fleeing to the city they are helping to dig their hometown's grave, hence the unresolved guilt. The protagonist, an I-Turner, was so loath to face his decision that instead he escaped into a false reality, complete with a fabricated lineage. Even so, he could not allow himself to be forgiven so easily, hence devising an invalid mother he would grow to hate, providing him the conduit to hate himself in turn. The curator lacked the outlet for shame possessed by the protagonist, leaving the guilt to build up inside him over the years like a poison. Finally he could suffer no more and returned to Innsmouth, only to damn his own admission of sin. U-turners can be brought back home by similar emotions. Between these two extremes is the delivery girl. She is proud of her roots, but not so much that she feels it necessary to stay in Innsmouth proper. Her base of operations is close enough to her hometown that she can live outside of it, free of guilt. A typical J-Turner, she strikes a balance between country and city living. As a piece of entertainment, Innmouth wo Oou Kage does not improve on the themes of the original work, or even reproduce them accurately. Yet it is better off for it. Most adaptations meet one of two horrific ends. Either they lash themselves to the original and drown in their attempt to be foolishly faithful, or an otherwise perfectly serviceable film crashes onto the rocks for deviating too far from the projected course. (Resident Evil comes to mind.) The movie avoids both of these fates by taking the middle path, incorporating Lovecraftian themes and settings with a culturally relevant spin. 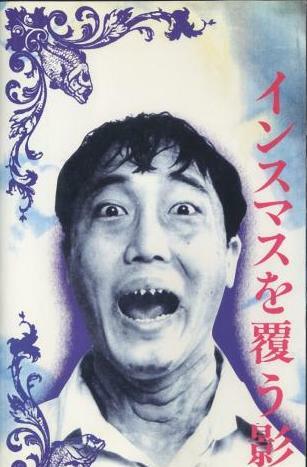 As to be expected from a budget TV production, the end result may not be up to the standards of certain astringent fans, but it proves that Japan is more than capable of spinning weird tales on it's home turf. Good Article. The thing is that TV adaptations usually are not that good. Take ABC Family and Lifetime for example. Just watching anything off those channels is enough to rot someones brain. Please note that have included the video and link to your blog in mine dedeicated to... Innsmouth! How cool! I have a videotape of this, but the youtube quality is much better. Nice article. The summary is really well written and the analysis is very clever. I've been waiting to watch this years I think. Great work, thank you! Happy that you found the blog, and even happier that the links are still active a year later! The VHS goes for $200 on Yahoo Auctions; thankfully the copyright police can't be arsed to drive these dinosaurs into extinction. This adaptation exhibits some traits that should be familiar to anyone prone to digesting copious amounts of narrative of Japanese produce. It can be faulted for focusing all its energy on its philosophical themes, which you distill in your analysis, rather than present the viewer with a solid plot, or even coherent narrative. These traits tend to become more obvious in longer narratives from Japanese writers, such as in animated series. There too often one witnesses important plot points being brought up then subsequently not delivered upon and often abandoned to form plot holes and weak links in dire need of mending. Of course this criticism is made from a western point of view of a person who had the disadvantage of growing up in a region where a watertight plot is always prioritized higher than thematic or philosophical interests in fiction. I often find myself frustrated with Japanese works that are well executed in all but the plot department. I get the feeling though that to the Japanese viewer as long as the thematic delivery is satisfactory any faults in the narrative or plot department is easily forgiven. Personally I would liked to have seen a better plot attached to this work. Then again with its short length it only had so many minutes to work with. I share a lot of these criticisms with literary pop stars like Murakami Haruki and Yoshimoto Banana--they do a good job of guiding me through an emotional adventure, but upon looking back, I realize that I'm actually staring into my own navel with nothing resolved, the treasure chest containing the great truths hinted at slammed shut as the back cover closes. With works like this, I'm never sure of the blame falls on the author for failing to deliver, or on me for expecting something that was never explicitly promised. Which is probably why I grasped at the thematic elements just to keep from going home empty-handed and feeling ripped off. In general, I think Japanese media is more about how it makes the viewer feel, rather than how tightly woven the plot is. Though it depends on the genre. Sci-Fi fans are notoriously strict on the minutia, and light novels also rest squarely on the foundation established by the narrative as opposed to floating just outside of consciousness on clouds of allegory and allusions. Lovecraft's work, expectantly, tends towards the dreamy. I might dig out some manga adaptations to present the opposite side of the spectrum: Slavishly accurate representations of mythos stories that fail because they explain too much, instead of too little.